Private schools also tend to be smaller, which comes with several benefits. For one, students experience small class sizes throughout their education, giving them the chance to get to know their professors very well. Additionally, students are able to schedule more one-on-one time when necessary, ensuring a level of individualized attention that is much harder to find at large public institutions. 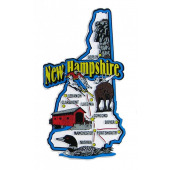 In New Hampshire, students can choose from private schools such as Saint Anselm College, Colby-Sawyer College, and Franklin Pierce University. Private universities like these give graduates a leg up when applying for jobs with companies such as Genesis Healthcare or Portsmouth Regional Hospital. Furthermore, students who pursue a bachelor’s degree to become a registered nurse will maintain an advantage over those who earned a two-year associate’s degree in nursing, as they will have much more experience and education from which to draw. Registered nurses in New Hampshire typically earn a salary of $62,000 per year, with the possibility of earning over $75,000 annually in some cases. If you’re interested in attending a nursing program at a private college or university, we’ve compiled below a list of the best private nursing schools in New Hampshire.